I have 162 films with France as the sole country of origin. If I remove documentaries, shorts, films in series, and films made in France by ex-pats of other countries (I consider Persepolis more an Iranian film than a French film, for example), I'm left with the list below. There's so much good stuff to choose from in this group, but right now I'm leaning toward L'Atalante. Even among cinema's legends, Jean Vigo stands apart. The son of a notorious anarchist, Vigo had a brief but brilliant career making poetic, lightly surrealist films before his life was cut tragically short by tuberculosis at age twenty-nine. 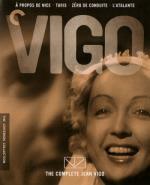 Like the daring early works of his contemporaries Jean Cocteau and Luis Buñuel, Vigo's films refused to play by the rules. This set includes all of Vigo's titles: À propos de Nice, an absurdist, rhythmic slice of life from the bustling coastal city; Taris, an inventive short portrait of a swimming champion; Zéro de conduite, a radical, delightful tale of boarding-school rebellion that has influenced countless filmmakers; and L'Atalante, widely regarded as one of cinema's finest achievements, about newlyweds beginning their life together on a canal barge. These are the witty, visually adventurous works of a pivotal film artist. I enjoyed this film and thought it was quite good, though I can't say that I thought this was one of the greatest films of all time. I think it had the potential to be one of those films, had Vigo been allowed to keep it the way he envisioned and if we had that version. This is, after all, a reconstructed version of L'Atalante, the film having been chopped by the distributor back in 1934. Vigo obviously had tremendous talent and it's a shame he died so young. There are a lot of wonderful shots, the camera work is very interesting, as is the lighting. The visual aspect, while a bit choppy in editing, is very lyrical and poetic nonetheless. Another thing Vigo really got right was in depicting the cramped space inside the barge. While the performances of the two newlyweds are solid, Michel Simon's character, Père Jules, steals the show. He's colorful, comical and salty, and I enjoyed him a lot. It is a kind of story you don't see very often - it begins with the wedding and at its core is about the difficulty of the couple to adjust to married life. Most romances are about the lead-up to the wedding and end with "they lived happily ever after" so it's refreshing to see a film address the reality of marriage being difficult. L'Atalante reminded me very much of Sunrise, and if you liked that film you'll like this one. Recommended for silent film lovers (even though this isn't silent, it has a silent film aesthetic to it) and film lovers in general, but not really the general public. While it's a very good film, the languid pacing alone would bore many modern viewers. I have 587 profiles that list The UK as country of origin, so rather than list them all I'll narrow it down to two: if we have time Wednesday we'll likely watch The 39 Steps (1935), but if we don't have time until Sunday we might try to watch Hamlet (1948). This was a really, really good film. Of course, with Hitchcock's name attached to it I was expecting it to be - and it didn't disappoint me. It had a great atmosphere, great cinematography, suspense, and excellent work from all the cast. Hitchcock really knew how to keep you interested, and how to pace and move things - you find out what's going on as Hannay does, which I felt really kept the suspense of the film going. The editing, script and dialogue are all great too. A really superb film. Recommended for anyone, unless you can't stand old movies. Then I feel sorry for you. I've seen all of them except Intermission and Kisses, so we'll be watching one of those. Thanks for the '39 Steps' review! been on the fence for a while. If i should buy it or not. But after what you say here, its worth its money? I'd say absolutely! It's definitely one I want to upgrade to blu. 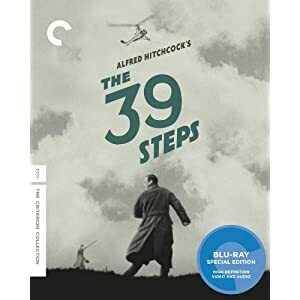 Be sure to get the Criterion version, the picture is really good and there are are lots of extras (including a documentary on Hitchcock I'm going to go back and watch sometime). I understand there are lots of poor quality releases of the film out there. But if there are more versions on blu, that are better etc. Please let me know! This is the Criterion blu cover. It's the one I intend to upgrade my DVD copy to. It's running $20 new and $15 used right now on Amazon. Fifty-four characters and eleven storylines intersect with "dazzling" (San Francisco Chronicle) results in this "raucously funny and compellingly gritty" (BBCi) comedy. An ingenious tale of small-town delinquents, shady cops and warring lovers reunited by a bizarre kidnapping plan, Intermission is a dark, edgy, "very funny study of love, lust and petty crime" (Sight & Sound)! This is a sort of gritty, slice-of-life of the working class kind of film. It had a kind of disjointed beginning, and I wasn't sure I was going to enjoy the movie, but I gave it a chance and as it developed I was drawn further in and everything came together wonderfully. It's entertaining and fun - and really, really funny at certain parts. The look on Colin Farrell's face when Cillian Murphy's character puts the brown sauce in his tea. I just about couldn't stop laughing. It's a bit violent, the language is coarse, but the dialogue is well written and the actors really embody their parts. I'll admit I bought it because of the presence of Colm Meaney, being the Trek fan I am, and he's great in it, but none of the actors are slouches. Recommended for anyone who's enjoyed an ensemble piece. Don't know which one we'll watch yet. This is the story of a bright, bored young man with lots of potential and nothing to do with it. His brilliant intellect is stifled by school, his dreams are suffocated by the isolation he is in. He meets the new girl in town, and for a moment in his life there is a bright spark and he hopes of escape. This is very much a character study of a brilliant, disaffected, isolated teenager and the life he is leading, drifting in and out of school, from one activity to another, unsure of where he is going, what he wants, or what the future will hold. Only sure that he wants to get out of here and do something. The cinematography choices enforces the isolated, lonely feeling - everything is white, blue and gray, snow and ice. Cold and bleak. Excellently done for this film. Recommended for lovers of art films. I enjoyed it, but it's not for everyone. We've seen Insomnia, so it will likely be one of the others. Just all around good movie.